The Fashion Design Council of India (FDCI) has been a frontrunner in taking forward Prime Minister Narendra Modi's 'Make in India' vision. Taking this a step further, FDCI organized a spectacular event showcasing the best of Indian textiles and craft at the ninth edition of the Vibrant Gujarat Global Summit. 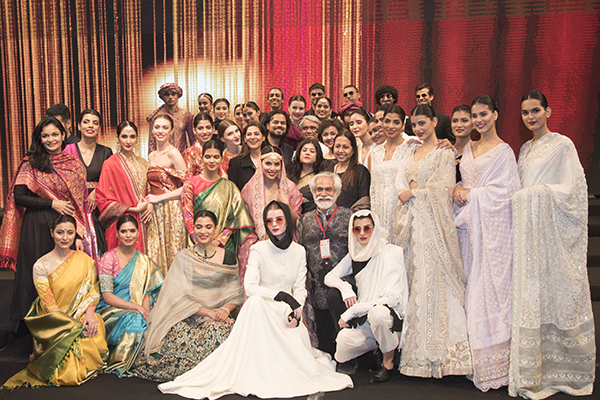 Seven of India's most talented textile gurus participated in this event, all of them interpreting the 'Make In India' theme in their distinctive signature style. The designers were Anju Modi, Gaurang Shah, Namrata Joshipura, Payal Jain, Rahul Mishra, Rajesh Pratap Singh and Shyamal & Bhumika. The show was held on the banks of the Sabarmati in Ahmedabad on Saturday, January 19. In her collection Raas Leela, Anju Modi showcased mashroo,Banarasi brocade and matka silk along with techniques like gold foil print, gota patti work and zardozi embroidery. Gaurang Shah presented Chitravali, featuring kalamkari inspired by Ajanta paintings on Kanjeevaram weaves. Namrata Joshipura showcased contemporary silhouettes with traditional brocades. Payal Jain’s pristine white Blanc collection had tone-on-tone usage of chikankari, appliqué, mirror-work, resham embroidery, mokaish, zardozi and glass beading on silk jamdani, chanderi, katrua and khinkhab. Rahul Mishra showcased traditional chikankari from Lucknow in his collection Charbagh. Khadi from Gujarat and Rajasthan mixed with ikat was presented by Rajesh Pratap Singh. Designer duo Shyamal & Bhumika curated Vayanti, a couture collection incorporating exquisite brocade from Gujarat.